(WTNH) -- Did you get a new smartphone or tablet? One of the very best apps you can install on your new device is the free News 8 app that is packed with cool features. 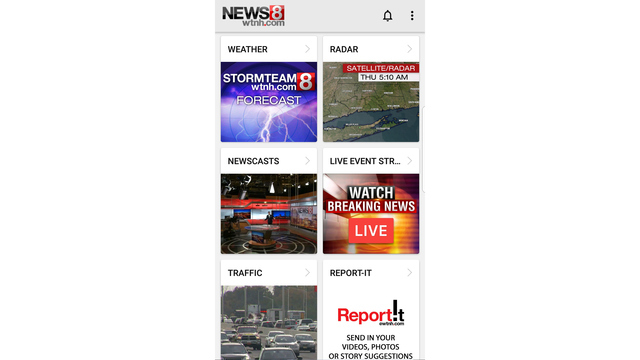 Take News 8 wherever you go, and never miss an important local news story with the free News 8 app. The News 8 app is packed with local news, weather, and sports, plus feature stories you're not going to see anywhere else. On the go? You can watch or listen to News 8 newscasts live on your phone. They're always available on the News 8 app. In the upper right hand corner, select the three vertical dots to display more options. If Notifications are Disabled, you can enable them at any time. You can customize your alerts to only get the news and weather alerts that matter to you by selecting "Customize Alerts".